For other Hungarian princesses named Elizabeth, see Elizabeth of Hungary (disambiguation). Saint Elizabeth of Hungary, T.O.S.F. (German: Heilige Elisabeth von Thüringen, Hungarian: Árpád-házi Szent Erzsébet; 7 July 1207 – 17 November 1231), also known as Saint Elizabeth of Thuringia or Saint Elisabeth of Thuringia, was a princess of the Kingdom of Hungary, Landgravine of Thuringia, Germany, and a greatly venerated Catholic saint who was an early member of the Third Order of St. Francis, by which she is honored as its patroness. Elizabeth was married at the age of 14, and widowed at 20. After her husband's death she sent her children away and regained her dowry, using the money to build a hospital where she herself served the sick. She became a symbol of Christian charity after her death at the age of 24 and was canonized on 25 May 1235. Elizabeth was the daughter of King Andrew II of Hungary and Gertrude of Merania. Her mother's sister was Hedwig of Andechs, wife of Duke Heinrich I of Silesia. Her ancestry included many notable figures of European royalty, going back as far as Vladimir the Great of the Kievan Rus. According to tradition, she was born in Hungary, possibly in the castle of Sárospatak (discussed below), on 7 July 1207. A sermon printed in 1497 by the Franciscan friar Osvaldus de Lasco, a church official in Hungary, is the first to name Sárospatak as the saint's birthplace, perhaps building on local tradition. The veracity of this account is not without reproach: Osvaldus also translates the miracle of the roses (see below) to Elizabeth's childhood in Sárospatak and has her leave Hungary at the age of five. According to a different tradition she was born in Pozsony, Hungary, (present-day Bratislava, Slovakia), where she lived in the Castle of Posonium until the age of four. Elizabeth was brought to the court of the rulers of Thuringia in central Germany, to be betrothed to Louis IV, Landgrave of Thuringia (also known as Ludwig IV), a future union which would reinforce political alliances between the families. [a] She was raised by the Thuringian court and would have been familiar with the local language and culture. In 1221, at the age of fourteen, Elizabeth married Louis; the same year he was enthroned as Landgrave, and the marriage appears to have been happy. In 1223, Franciscan friars arrived, and the teenage Elizabeth not only learned about the ideals of Francis of Assisi, but started to live them. Louis was not upset by his wife's charitable efforts, believing that the distribution of his wealth to the poor would bring eternal reward; he is venerated in Thuringia as a saint, though he was never canonized by the Church. It was also about this time that the priest and later inquisitor Konrad von Marburg gained considerable influence over Elizabeth when he was appointed as her confessor. In the spring of 1226, when floods, famine, and plague wrought havoc in Thuringia, Louis, a staunch supporter of the Hohenstaufen Frederick II, Holy Roman Emperor, represented Frederick II at the Imperial Diet held in Cremona. Elizabeth assumed control of affairs at home and distributed alms in all parts of their territory, even giving away state robes and ornaments to the poor. Below Wartburg Castle, she built a hospital with twenty-eight beds and visited the inmates daily to attend to them. Elizabeth's life changed irrevocably on 11 September 1227 when Louis, en route to join the Sixth Crusade, died of a fever in Otranto, Italy, just a few weeks before the birth of her daughter Gertrude. Upon hearing the news of her husband's death, Elizabeth reportedly said, "He is dead. He is dead. It is to me as if the whole world died today." His remains were returned to Elizabeth in 1228 and entombed at the Abbey of Reinhardsbrunn. After Louis' death, his brother, Henry (German: Heinrich) Raspe, assumed the regency during the minority of Elizabeth's eldest child, Hermann (1222–1241). After bitter arguments over the disposal of her dowry — a conflict in which Konrad was appointed as the official Defender of her case by Pope Gregory IX — Elizabeth left the court at Wartburg and moved to Marburg in Hesse. Up to 1888 it was believed, on account of the testimony of one of Elizabeth's servants during the canonization process, that Elizabeth was driven from the Wartburg in the winter of 1227 by her brother-in-law, Heinrich Raspe, who acted as regent for her son, then only five years old. About 1888 various investigators (Börner, Mielke, Wenck, E. Michael, etc.) asserted that Elizabeth left the Wartburg voluntarily. She was not able at the castle to follow Konrad's command to eat only food obtained in a way that was certainly right and proper. Following her husband's death, Elizabeth made solemn vows to Konrad similar to those of a nun. These vows included celibacy, as well as complete obedience to Konrad as her confessor and spiritual director. Konrad's treatment of Elizabeth was extremely harsh, and he held her to standards of behavior which were almost impossible to meet. Among the punishments he is alleged to have ordered were physical beatings; he also ordered her to send away her three children. Her pledge to celibacy proved a hindrance to her family's political ambitions. Elizabeth was more or less held hostage at Pottenstein, the castle of her uncle, Bishop Ekbert of Bamberg, in an effort to force her to remarry. Elizabeth, however, held fast to her vow, even threatening to cut off her own nose so that no man would find her attractive enough to marry. Elizabeth's second child Sophie of Thuringia (1224–1275) married Henry II, Duke of Brabant, and was the ancestress of the Landgraves of Hesse, since in the War of the Thuringian Succession she won Hesse for her son Heinrich I, called the Child. Elizabeth's third child, Gertrude of Altenberg (1227–1297), was born several weeks after the death of her father; she became abbess of the monastery of Altenberg Abbey, Hesse near Wetzlar. Elizabeth built a hospital at Marburg for the poor and the sick with the money from her dowry, where she and her companions cared for them. Her official biography written as part of the canonization process describes how she ministered to the sick and continued to give money to the poor. A statue showing the miracle of the roses in the rose garden in front of the neo-Gothic church dedicated to her at Roses' Square (Rózsák tere), Budapest. Elizabeth is perhaps best known for her miracle of the roses which says that whilst she was taking bread to the poor in secret, she met her husband Ludwig on a hunting party, who, in order to quell suspicions of the gentry that she was stealing treasure from the castle, asked her to reveal what was hidden under her cloak. In that moment, her cloak fell open and a vision of white and red roses could be seen, which proved to Ludwig that God's protecting hand was at work. Her husband, according to the vitae, was never troubled by her charity and always supported it. In some versions of this story, it is her brother in law, Heinrich Raspe, who questions her. Hers is the first of many miracles that associate Christian saints with roses, and is the most frequently depicted in the saint's iconography. Another story about St Elizabeth, also found in Dietrich of Apolda's Vita, relates how she laid the leper Helias of Eisenach in the bed she shared with her husband. Her mother-in-law, who was horrified, told this immediately to Ludwig on his return. When Ludwig removed the bedclothes in great indignation, at that instant "Almighty God opened the eyes of his soul, and instead of a leper he saw the figure of Christ crucified stretched upon the bed." This story also appears in Franz Liszt's oratorio about Elizabeth. In 1231, Elizabeth died in Marburg at the age of twenty-four. Very soon after the death of Elizabeth, miracles were reported that happened at her grave in the church of the hospital, especially those of healing. On the suggestion of Konrad, and by papal command, examinations were held of those who had been healed between August 1232 and January 1235. The results of those examinations was supplemented by a brief vita of the saint-to-be, and together with the testimony of Elizabeth's handmaidens and companions (bound in a booklet called the Libellus de dictis quatuor ancillarum s. Elizabeth confectus), proved sufficient reason for quick canonization. She was canonized by Pope Gregory IX on 25 May 1235. Elizabeth's shrine became one of the main German centers of pilgrimage of the 14th century and early 15th century. During the course of the 15th century, the popularity of the cult of St Elizabeth slowly faded, though to some extent this was mitigated by an aristocratic devotion to St Elizabeth, since through her daughter Sophia she was an ancestor of many leading aristocratic German families. The papal bull declaring her a saint is on display in the Schatzkammer of the Deutschordenskirche in Vienna, Austria. Her body was laid in a magnificent golden shrine—still to be seen today—in the Marburg church bearing her name. But three hundred years after her death, one of Elizabeth's many descendants, the Landgrave Philip I "the Magnanimous" of Hesse, a leader of the Protestant Reformation and one of the most important supporters of Martin Luther, raided the church in Marburg and demanded that the Teutonic Order hand over Elizabeth's bones, in order to disperse her relics and thus put an end to the already declining pilgrimages to Marburg. Philip took away the crowned agate chalice in which her head rested, but returned it after being imprisoned by Charles V, Holy Roman Emperor. The chalice was subsequently plundered by Swedish troops during the Thirty Years' War and is now on display at The Swedish History Museum in Stockholm. Her skull and some of her bones can be seen at the Viennese convent bearing her name. 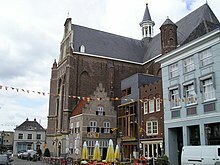 A portion of her relics were kept in the church of the Carmelites at Brussels; another in the magnificent chapel of La Roche-Guyon, upon the Seine, and a considerable part in a precious shrine is in the electoral treasury of Hanover. The Elisabethkirche is now a Protestant church, but has spaces set aside for Catholic worship. Marburg became a center of the Teutonic Order, which adopted St. Elizabeth as its secondary patroness. The Order remained in Marburg until its official dissolution by Napoleon in 1803. After her death, Elizabeth was commonly associated with the Third Order of Saint Francis, the primarily lay branch of the Franciscan Order, which has helped propagate her cult. Whether she ever actually joined the order, only recently founded in 1221, the year when she married Louis at the age of fourteen, is not proven to everyone's satisfaction. It must be kept in mind though that the Third Order was such a new development in the Franciscan movement, that no one official ritual had been established at that point. Elizabeth clearly had a ceremony of consecration in which she adopted a Franciscan religious habit in her new way of life, as noted above. From her support of the friars sent to Thuringia, she was made known to the founder, St Francis of Assisi, who sent her a personal message of blessing shortly before his death in 1226. Upon her canonization she was declared the patron saint of the Third Order of St Francis, an honor she shares with St Louis IX of France. 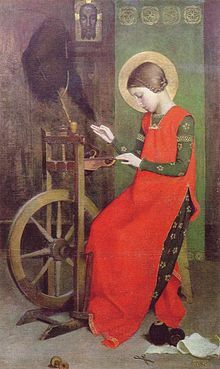 Saint Elizabeth is often depicted holding a basket of bread, or some other sort of food or beverage, characteristic of her devotion to the poor and hungry. Two of her miracles were of particular interest for the artists, the "Miracle of the roses" and the "Crucifix in the bed" (see under "Lifetime miracles"). Elizabeth of Hungary was almost certainly the inspiration for the character Elizabeth in Richard Wagner's opera Tannhauser. Peter Janssens composed a musical play ("Musikspiel") Elisabeth von Thüringen in 1984 on a libretto by Hermann Schulze-Berndt [de]. The year 2007 was proclaimed Elizabeth Year in Marburg. All year, events commemorating Elizabeth's life and works were held, culminating in a town-wide festival to celebrate the 800th anniversary of her birth on 7 July 2007. Pilgrims came from all over the world for the occasion, which ended with a special service in the Elisabeth Church that evening. A new musical based on Elizabeth's life, Elisabeth--die Legende einer Heiligen (Elizabeth--Legend of a Saint), starring Sabrina Weckerlin as Elizabeth, Armin Kahn as Ludwig, and Chris Murray as Konrad, premiered in Eisenach in 2007. It was performed in Eisenach and Marburg for two years, and closed in Eisenach in July 2009. The entire Third Order of St. Francis, both the friars and sisters of the Third Order Regular and the Secular Franciscan Order, joined in this celebration through a two-year-long program of study of her life. This was conducted throughout the Order, across the globe. There were also religious ceremonies held worldwide during that period. The yearlong observance of the centennial which began on her feast day in 2007 was closed at the General Chapter of the Order, held in Budapest in 2008. The New York region of the Order produced a movie of her life, produced by a sister of the Order, Lori Pieper. Saint Elizabeth Of Hungary: on the seventh century of her death, Hungary issued a set of four stamps in her honor: on 21 April 1932; on 1 August 1944 one postage stamp was issued; on 16 July 1938 Czechoslovakia issued a stamp in her honor showing the St. Elizabeth Cathedral in Košice. Woodcarved polychrome sculpture of St Elizabeth with a beggar, by Rudolf Moroder, Parish church of Urtijëi, Italy. St Elizabeth, Miracle of the roses. ^ Some, however, (see the Catholic Encyclopedia) have suggested that Ludwig's brother Hermann was in fact the eldest, and that she was first betrothed to him until his death in 1232, but this is doubtful. An event of this magnitude would almost certainly be mentioned at least once in the many original sources at our disposal, and this is not the case. Rather, the 14th-century "Cronica Reinhardsbrunnensis" specifically names Hermann as the second son. In addition, the only contemporary document (dated 29 May 1214) that might support Hermann's claim to be the eldest by putting his name before that of Louis relates to a monastery in Hesse. This, it has been suggested, actually supports the claim that Hermann was the younger of the two, as Hesse was traditionally the domain of the second son, and thus it would be normal that his name be mentioned first, as this document deals with his territory. ^ Wolf, Kenneth Baxter, ed. (24 November 2010). The Life and Afterlife of St. Elizabeth of Hungary: Testimony from her Canonization Hearings. Oxford University Press. p. x. ISBN 9780199732586. Retrieved 22 December 2013. ^ Hackett, Mary, ed. (1848). The life of Saint Elizabeth of Hungary, Dutchess of Thuringia. Books.google.com. p. 244. Retrieved 22 December 2013. ^ Paolo Bonavoglia. "Perpetual calendar". Astro.bonavoglia.eu. Retrieved 22 December 2013. ^ a b c d Bihl, Michael (1909). "St. Elizabeth of Hungary" . In Herbermann, Charles (ed.). Catholic Encyclopedia. 5. New York: Robert Appleton Company. ^ "Saint Elizabeth of Hungary". Encyclopædia Britannica. Retrieved 5 November 2017. ^ a b Chisholm, Hugh, ed. (1911). "Elizabeth, Saint" . Encyclopædia Britannica. 9 (11th ed.). Cambridge University Press. p. 287. ^ Albrecht, Thorsten; Atzbach, Rainer (2007). Elisabeth von Thüringen: Leben und Wirkung in Kunst und Kulturgeschichte. Petersberg: Michael Imhof Verlag. p. 7. ^ Ohler, Norbert (2006). Elisabeth von Thüringen: Fürstin im Dienst der Niedrigsten. Gleichen: Muster-Schmidt Verlag. p. 15. ^ Zippert, Christian; Gerhard Jost (2007). Hingabe und Heiterkeit: Vom Leben und Wirken der heiligen Elisabeth. Kassel: Verlag Evangelischer Medienverband. p. 9. ^ Ortrud Reber, Elizabeth von Thüringen, Landgräfin und Heilige (Regensburg: Pustet, 2006), pp. 33–34. ^ Reber, Ortrud (2006). Elisabeth von Thüringen, Landgräfin und Heilige. Regensburg: Pustet. ISBN 9783791720142. ^ Rainer Koessling, ed. and trans., Leben und Legende der heiligen Elisabeth nach Dietrich von Apolda (Frankfurt am Main: Insel Verlag, 1997), 52. ^ Rainer Koessling, ed. and trans., Leben und Legende der heiligen Elizabeth nach Dietrich von Apolda (Frankfurt am Main: Insel Verlag, 1997), 59. ^ a b Hagiography of Saint Elizabeth of Hungary, by Charles Forbes René de Montalembert, 1839. ^ McNichols, William (November 1985). "Elizabeth of Hungary:For Everything there is a Season". The Cord. 35 (10): 297–302. Archived from the original on 28 May 2013. Retrieved 14 December 2012. ^ a b Joan Mueller, A Companion to Clare of Assisi: Life, Writings, and Spirituality, Vol. 21, (Brill, 2010), 127. ^ Swedish History Museum staff. "Guldrummet - Krigsbyten" (in Swedish). Retrieved 2 October 2016. ^ See Kaspar Elm, "Die Stellung der Frau in Ordenswesen, Semireligiosentum und Häresie zur Zeit der heiligen Elisabeth" (Sankt Elisabeth: Fürstin, Dienerin, Heilige), Sigmaringen: Thorbecke, 1981; pp. 7–28. ^ Birmingham Museum of Art: guide to the collection. Birmingham, Ala: Birmingham Museum of Art, 2010. ^ "2013: Die Päpstin - Das Musical" (in German). Spotlightmusical.de. 21 July 2013. Retrieved 22 December 2013. ^ A Woman for our Times Archived 2012-03-11 at the Wayback Machine, ciofs.org; accessed 5 November 2017.
de Robeck, Nesta. Saint Elizabeth of Hungary : A Story of Twenty-Four Years. Milwaukee: The Bruce Publishing Company, 1954. Seesholtz, Anne. Saint Elizabeth: Her Brother's Keeper. New York: Philosophical Library, 1948. Wikimedia Commons has media related to Elisabeth of Hungary, Landgravine of Thuringia. "Saint Elizabeth of Hungary - Patron Saints Index". Archived from the original on Nov 1, 2018 – via saints.sqpn.com. "Biography of Saint Elizabeth of Hungary". aints.info. Archived from the original on Apr 24, 2015. "Elizabeth of Hungary: princess and saint". Invisible Monastery of charity and fraternity - Christian family prayer. Archived from the original on Mar 16, 2011. "St. Elizabeth of Hungary, founder of hospitals". itmonline.org. Archived from the original on Sep 26, 2006.